1. Cut cherry tomatoes in half, and cut cucumber and Oba leaf into thin strips. Drain water from corn. 2. Boil Soba buckwheat noodle with plenty of hot water, soak, and strain it well. 3. 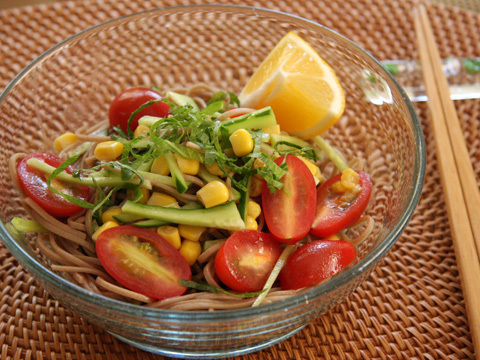 Move the Soba buckwheat noodle into container, add sesame oil, and add items from line 1 and Nijiya soba tsuyu sauce. Mix them well. 4. Decorate them on a bowl and garnish with lemon slices.